Are you good at flipping burgers , waiting tables or stocking shelves? 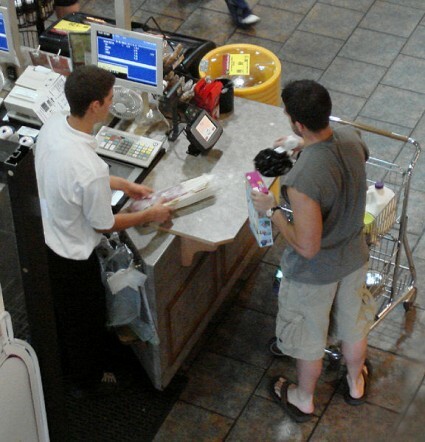 Are you proficient with a cash register? Do you enjoy doing mindless work for very low pay? If you answered yes to any of those questions, then you are probably going to fit in very well in the new U.S. economy. According to a report that has just been released by the National Employment Law Project, 58 percent of the jobs that have been created since the end of the recession have been low paying jobs. So exactly what is a low paying job? Well, the National Employment Law Project defines it as a job with an hourly wage between $7.69 and $13.83. But of course you can’t pay a mortgage or support a family on $13.83 an hour. Even if you got full-time hours the entire year, you would make less than $28,000 on an annual basis. The federal poverty level for a family of five is $27,010. So needless to say, most of these new jobs are not paying enough to support a middle class lifestyle. This represents an economic failure on a fundamental level. Our economy is producing very few good jobs that enable people to be able to raise families and live the American Dream. The ranks of “the working poor” are exploding and the number of Americans that are dependent on the government is sitting at an all-time record. Sadly, if current trends continue things are going to get a lot worse. The numbers compiled by the National Employment Law Project are absolutely stunning. Most of the jobs lost during the recent recession were mid-wage jobs, and most of the jobs created since then have been low wage jobs. This represents a fundamental shift in our economy. Just check out these figures…. –21 percent of the jobs lost during the last recession were low wage jobs paying between $7.69 and $13.83 an hour. –58 percent of the jobs created since the end of the recession have been low wage jobs paying between $7.69 and $13.83 an hour. 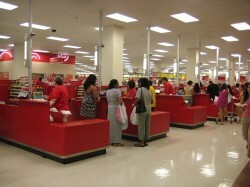 –60 percent of the jobs lost during the last recession were mid-wage jobs paying between $13.84 and $21.13 an hour. –22 percent of the jobs created since the end of the recession have been mid-wage jobs paying between $13.84 and $21.13 an hour. But even the high end of the mid-wage pay scale is not that great. If you make $21.13 an hour and you work full-time hours for the entire year you will end up making about 42,000 for an entire year. Yes, that can probably support a family of four in most areas of the country, but you really have to scrimp and save to do it. And keep in mind that 80 percent of all the jobs being created now pay at that level or less. Welcome to the new U.S. economy. It really stinks for workers. The truth is that there has been a fundamental cultural change in our economy. Workers are no longer valued. They are viewed as expensive liabilities that should be disposed of as rapidly as possible once their usefulness has ended. There is very little loyalty to workers these days, and most big corporations do not really care about the quality of the lives of their workers. The number of companies offering health insurance to their workers continues to decline (and thanks to Obamacare that decline is accelerating even further), and the number of companies offering pension plans to their workers continues to decrease as well. At this point, less than 25 percent of all jobs in the United States are good jobs, and that number continues to shrink. Is this because the big corporations are not making enough money? 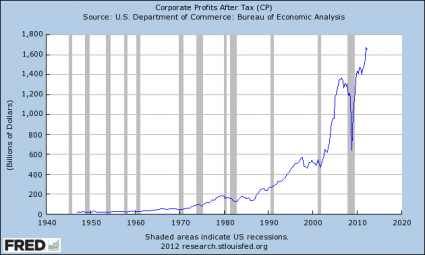 In fact, corporate profits have been setting all-time records in recent years…. 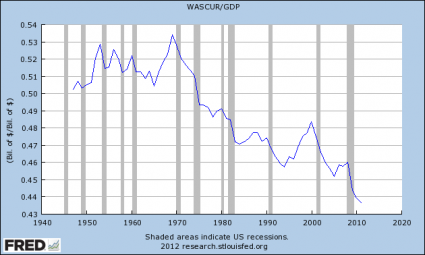 Meanwhile, wages as a percentage of the economy are at an all-time low…. Well, I already talked about the fundamental cultural shift that is happening. Companies simply do not care about their workers like they used to. America is becoming a very cold place. Another major factor is that millions upon millions of our good jobs have been shipped overseas thanks to the emerging one world economy. In the old days, U.S. corporations were more or less forced to hire American workers and the wages earned from a typical manufacturing job could easily support a growing family. That has entirely changed now. The big corporations no longer need American workers to make stuff. They can just close up shop and move their facilities to the other side of the globe where it is legal to pay slave labor wages to very desperate workers. And now there is greatly increased competition for the jobs that we still have in this country because so many of our jobs have disappeared. If you don’t like how your employer is treating you that is just too bad. In most cases your employer would have absolutely no problem finding a replacement for you. In fact, there are probably thousands of people in your community that are desperate for a job such as yours. It means that the decline of the middle class in America is going to get a lot worse. American families are rapidly getting poorer. Real median household income has fallen another 4.8 percent since the last recession ended. Meanwhile, the cost of living continues to go up and American family budgets are being stretched to the limit. In a previous article, I noted that 62 percent of all middle class Americans say that they have had to reduce household spending over the past year. Things have fundamentally changed. The days of endless prosperity for the middle class are gone for good. You are going to have to adjust. At this point, 77 percent of all Americans are living paycheck to paycheck at least some of the time. If you are relying solely on a job for the financial survival of your family, then you are probably in a similar situation. Do you know why they call it a “job”? It is because you will mostly likely end up living “Just Over Broke” for most of your life. A major shift in our economy is happening. We are transitioning from an “employment economy” to an “ownership economy”. Most Americans that are currently working for others are not going to have a bright economic future. That may sound harsh, but it is the truth. Even if you are still one of the fortunate Americans that still has a good job, you need to start thinking about what you are going to do when you lose that job someday. The system is failing, and if you have blind faith that it is always going to take care of you and provide a job for you then you are likely to be bitterly disappointed someday.